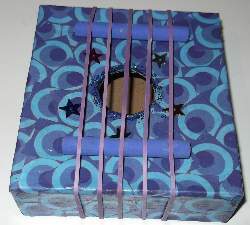 This home made musical instrument is made from a box, like so many of my other recycling crafts on this site. But we don`t know what to call it? Maybe by the time you make it you can help us give it a name. If you can find a small box, great! Just cut out a perfect hole using a compass. 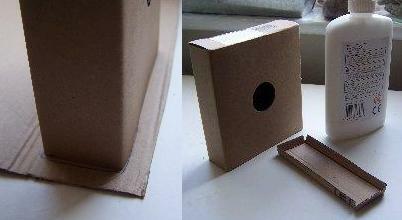 You can also cut the end off a long box and make a side for it. We got little boxes ready made from items we bought in Ikea, a great material source for our cardboard box crafts. 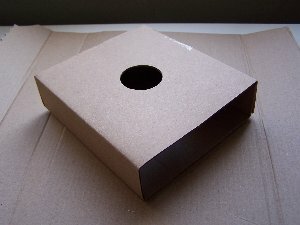 Find another piece of stiff cardboard big enough to make a side to your box, and draw an outline of the end. Add about 1 cm tabs to each side and cut it out. 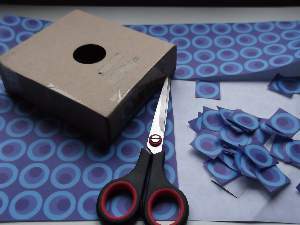 Fold the tabs inwards and put glue on each of them. Place glue on the inside of the box edges and stick in place. You now have a resonator. A sound box. Before you add the elastic bands for the strings, do you want to decorate it? 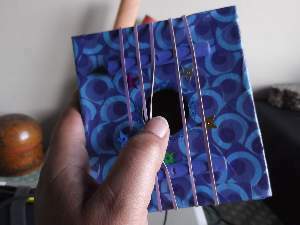 You will have a nicer home made musical instrument to show your friends if you do. 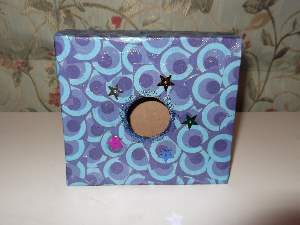 I chose a nice sheet of wrapping paper with blue circles and decoupaged my box. This makes the box stronger and a better resonator too! Once it dries you can add some sparkle. A few stars and some glitter. Get your 5 elastic band and stretch them parallel to each other over the box. Use 2 small pencils or pieces of dowel to make a bridge so your strings can play. We painted the dowels to match the box. Now you can pluck or strum your home made musical instrument. To tune the strings just move the dowels inwards or outwards. You can also stretch them more at the front and slacken off at the back. Now what shall we call this nice little music box? Got any ideas? How about a Boxsong or a Boxitar? Do we have a full home made orchestra yet? See more ideas for kid crafts here on the Home Page.